U.S. Supreme Court nominee Brett Kavanaugh went to the White House on Monday after strongly denying that he sexually assaulted a teenage girl three decades ago when they both were in high school, an accusation that has thrown his nomination to the lifetime appointment into turmoil. "Because this never happened, I had no idea who was making this accusation until she identified herself yesterday," Kavanaugh said in a statement Monday. "I am willing to talk to the Senate Judiciary Committee in any way the Committee deems appropriate to refute this false allegation, from 36 years ago, and defend my integrity.” The federal circuit judge declared he had "never done anything like what the accuser describes." Christine Blasey Ford alleged in a Washington Post interview published Sunday that she feared for her life when Kavanaugh and a friend, both "stumbling drunk," cornered her in a bedroom at a house party in suburban Washington in the early 1980s and Kavanaugh groped her. All 10 Democratic Party members of the Senate Judiciary Committee are calling for the panel’s Republican chairman to postpone Thursday’s planned vote on Kavanaugh. Committee chairman Senator Chuck Grassley said "Anyone who comes forward as Dr. Ford has deserves to be heard, so I will continue working on a way to hear her out in an appropriate, precedented and respectful manner....we are working diligently to get to the bottom of these claims," he said in a statement. Republican Senator Susan Collins tweeted that both Ford and Kavanaugh should testify under oath. White House adviser Kellyanne Conway told reporters earlier Monday that Ford "should not be insulted and she should not be ignored." FILE - White House Counselor Kellyanne Conway speaks at the Conservative Political Action Conference (CPAC) at National Harbor, Maryland, Feb. 23, 2018. The Judiciary panel questioned the 53-year-old Kavanaugh for two days earlier this month. Democrats and a handful of Republican lawmakers are calling for time to hear Ford's accusations and Kavanaugh's response. Republicans, some of whom see the allegations as a stalling tactic of Democrats, have been pushing to confirm Kavanaugh before November’s mid-term elections when they could lose control of the Senate. Ford is not taking a position, Katz said, on whether Kavanaugh ought to withdraw his bid to fill the vacancy left by the retirement of Justice Anthony Kennedy. “She believes that these allegations obviously bear on his character and his fitness, and the denials of course bear on his character and fitness,” Katz told NBC. Ford said in the interview with the newspaper that Kavanaugh threw her down on a bed, grinding his body against hers and trying to pull off her one-piece bathing suit and the clothing she was wearing over it. Ford said that when she tried to scream, he put his hand over her mouth. Ford said she escaped when Kavanaugh's friend jumped on top of them, sending all three tumbling. Ford said she ran from the room, briefly locking herself in a bathroom and then fleeing from the house. "If the committee is to hear from Ms. Ford, it should be done immediately so the process can continue as scheduled," Graham said. 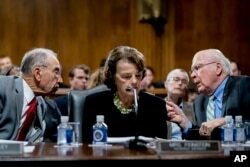 Senate Judiciary Committee Chairman Chuck Grassley, R-Iowa, left, accompanied by Sen. Dianne Feinstein, D-Calif., the ranking member, center, speaks with Sen. Patrick Leahy, D-Vt., right, during a Senate Judiciary Committee markup meeting on Capitol Hill. The top Democrat on the panel, Sen. Dianne Feinstein, led a number of Democrats calling for a delay in the vote. Senate Minority Leader Charles Schumer also called for a delay in the confirmation process while Ford's allegations are investigated.